LAKEWOOD, Wash. - As part of I Corps\' efforts to stay connected with surrounding communities, Command Sgt. Maj. Frank Grippe updated the Lakewood Chamber of Commerce military affairs committee on the return of I Corps from a deployment in Iraq and preparations for the return of 18,000 more Soldiers and Airmen throughout the summer. Amid pancakes and omelets, Burs Restaurant played host to a packed crowd of business and civic leaders June 15. "Those sitting here today represent some of the strongest ranks of support for our military folks," Grippe said. Community support from cities such as Lakewood is key to the welfare of Soldiers stationed at Joint Base Lewis-McChord, he said. "It's a real interesting time for our United States," Grippe said. "There's a real different element of morale." The unwavering support for the military from the public is unprecedented in modern history, he said. Grippe thanked the chamber for their support and for the partnership of businesses and organizations throughout Lakewood. Since the unit's return in March, I Corps has been working hard to reintegrate and reset itself within the community, he said. "For a year in Iraq, we really moved the ball forward," Grippe said. "We really did a lot of great things in Iraq." The corps successfully completed its mission and paved the way for secure and open national elections in Iraq, he said. "I couldn't be more proud of what our corps did," Grippe said. "They had a real positive effect now and for the future." One of the biggest adjustments in returning home is seeing the transition to JBLM, he said. "It's truly a joint base," Grippe said. "I look at us as one holistic community." With the transition to JBLM becoming official Oct. 1, most of the logistical and administrative changes are already complete, he said. "It's there now," Grippe said. "We're truly the power-projection platform on the West Coast." Even with main body returns from 5th Brigade, community support remains vital to the war-fighting effort, he said. "There's still a few thousand other troops from (JBLM) who are still in harm's way on a daily basis," Grippe said. The global war on terrorism continues to be the operational focus of I Corps, he said. Grippe said the corps is ready to meet any challenge and any mission presented. 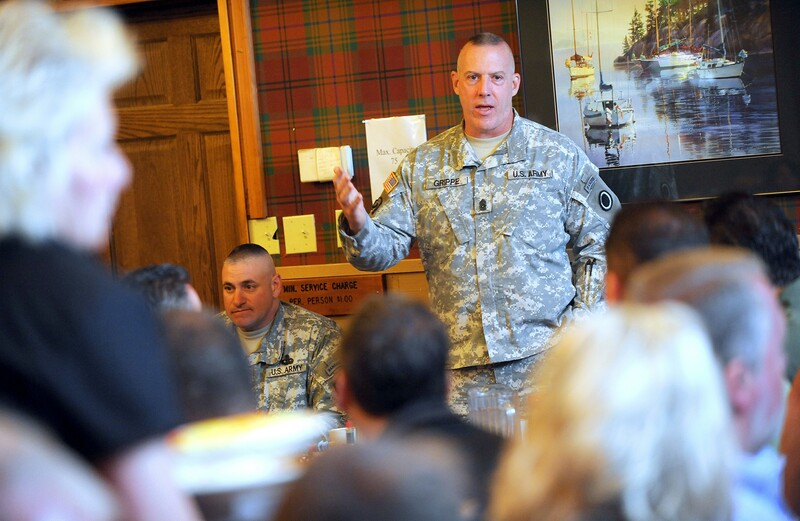 "I can tell you, as their sergeant major, I can't be any prouder," Grippe said. "First Corps will always be a war-fighting corps." Rick Wood is a reporter with Joint Base Lewis-McChord's weekly newspaper, the Northwest Guardian.